A new track system available from Muddy River Agricultural is helping Western Australia growers Tom and Andrea Carmody reduce soil compaction on their property, resulting in improved yields. Sixth generation farmers Tom and Andrea run a 3,200-hectare property, ‘Clare Downs’ at Cascade, 100km northwest of Esperance. To avoid the rutting caused by their chaser bin in the moist soil following an unusually wet harvest last year, Tom sought a set of tracks that was easy to fit and versatile enough to move between his 25-tonne chaser bin and John Deere 1910 air cart. The soil compaction caused by the wet conditions affected the yield last year. Against average yields of around 1.2 tonnes per hectare for canola, 2.4 tonnes per hectare for wheat and 2.7 tonnes per hectare for barley, they could actually see a visible crop loss in the wet areas, which they suspected came about from the combination of wet soil and heavy tyres resulting in soil compaction. The Soucy ST-032 tracks, distributed by Muddy River provided the solution sought by Tom. Featuring a simple track tensioning system and a gross load capacity of 40 tonnes, the tracks are 813mm wide and 1,451mm high, giving a footprint of nearly 2.5m² per track. The tracks were used in the harvest in late November this year and caused less damage to the soil than their old single wheel system. 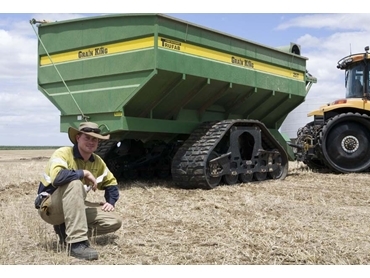 As one of the few growers in the region with tracks fitted to his chaser bin, Tom attracts some attention from neighbours keen to know the benefits. Tom explains that the tracks offer benefits such as reduced compaction and rutting, with the reduced compaction resulting in higher yields and improved profitability. The tracks are also easy to remove and install, allowing simple swapping between machines. Advantages of the Soucy track systems also include proven reduced fuel consumption with the tracks offering fuel savings of almost 4% on hard, dry soils and greater savings to be expected in wet, muddy soils where they are more effective. Given the obvious benefits and potential yield advantages, Tom expects more growers to adopt the Soucy tracks for their air carts and grain carts.